“Off Italy?” No . 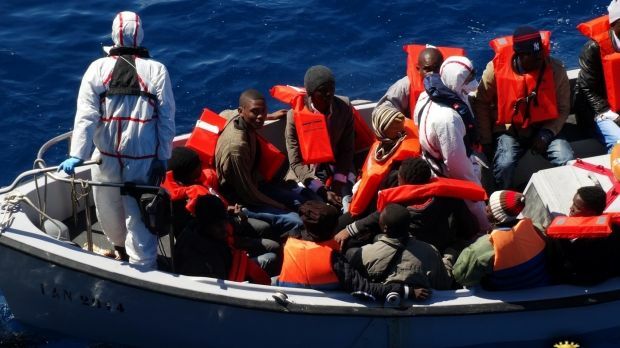 Other reports that said the Italian Navy picked them straight up from the Libyan coast, which means we’re now offering a free ferry service for black Africans, most of them Mohammedans from safe countries. 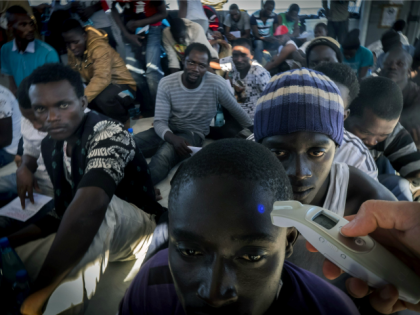 Officials fear the numbers of migrants trying to reach southern Italy by sea, relatively contained so far this year, will increase as sailing conditions improve in warmer weather and as the migrant route to Europe via Greece dries up after a deal brokered by the United Nations will result in economic migrants being sent back to Turkey. New boat arrivals in Mithymna on Lesbos, Greece, have reduced to almost zero over the last few days, but it remains unclear whether that is due to the windy weather or the deal between the EU and Turkey. The numbers of people reaching Greece from Turkey have declined since an EU-Turkey deal went into effect on March 20… Before the deal, the numbers arriving each day had numbered in the thousands. On Monday, 1,662 people arrived, but this fell to 600 on Tuesday and 260 on Wednesday. The Turkish coastguard on Sunday stopped five boats carrying dozens of illegal migrants, mostly from Myanmar, who were trying to reach the Greek island of Lesbos, local media reported. If they are Sunni why are they ‘fleeing’ from THEIR beloved Islamic State? Is this not the one that has been promised to them by the Allah of their Qur’an? If the future belongs to those who enforce Islamic blasphemy laws, we don’t have a future. The Refugee Council has accused Australian immigration officials of “cherry picking” Middle Eastern refugees to be resettled in Australia. “I don’t think anyone expected that the program would be weighted as strongly towards Iraqi Christians as it now appears,” Paul Power, the council’s CEO, told 7.30. The sickness of the bleeding hearts…. That’s not “divisive”, of course not. This is way too simplistic. There are no “radical” and “moderate” Muslims. The “moderate Muslims” are just biting their time. They only differ in strategy from the “radicals”. The peaceful mosqueteers believe in the same Islam, they just don’t think the time is right to strike yet. In the end, its demographics that decide the outcome. Those who engage in jihad terror are only waking up sleeping infidel dogs. That might cause the dreaded “backlash” that Muslims are so worried about. These radical Islamist devout Muslim preachers took their extremist message to the streets of London and got shut down again and again by ordinary Muslims. Hollande never meant to act. That would be against his nature. He shouldn’t drop these plans. Its all just a matter of perceptions. “Misconception dispelling” is the speciality of millions of Islamic da’awa gigolos in the west, and Obama is but one of them. Barry Soetoro aka Hussein Obama had crosses covered up when he spoke before mostly catholic students in Georgetown. He never has a problem with standing before Islamic symbols. Imbalanced reporting on Muslims and British Islamic community’s media illiteracy contribute to “hostility”, study says. “There is an underrepresentation of Muslims working in the media,”-Right. All it takes is to stack the ranks with muselmanic scribblers and bingo: no kafir will dare to write anything negative about Mohammedanism for fear of being blown up. Keep hammering us with your BS, muftis and fellow travellers: we’ve got your number. We ain’t buying any. It was hardly the first or last time women have been assaulted during a big public holiday in Germany, but it is the first time, thanks to the obsessive discussion (sic) that followed the New Year’s attacks, that many Germans have learned about a shocking feature of the country’s sexual assault law: Most of what happened that night in Cologne is not actually a crime. Amrikiee did it! The West caused it all…. Move by State Department and Pentagon comes as Turkish leader Recep Tayyip Erdogan is set to arrive to Washington. Comment from someone not very well travelled nor versed in areas in which he prognosticates. Am sure that the people killed (in) Nairobi mall, Paris, Brussels, New York, Ankara, Istanbul, Bali, Tunis etc were questioning their bigoted past before they were killed. Travel in some hard parts of the world, economy class by foot may expand your rather closed mind. I know your “thing” is to be controversial and eloquent, but some real life experience may temper your strange world view. Possibly. Education is supposed to allow discernment. Tempered by real life experience it is powerful. Alone it is like an empty vessel. Methinks you are an empty vessel railing against things about which you have theoretical learning but nil practical experience..
Aladdin Sisalem, a 25-year-old Palestinian born in Kuwait, has spent the last four years in search of a country that could offer him freedom from persecution. On May 31, he finally found it, as he flew into Melbourne with a visa in his bag…. For 10 months, Aladdin was the only prisoner on Manus Island while the Australian government denied responsibility for him…. Forget about the hijacker. Its just a distraction from the jihad. They shout “God is great” “Allah is greater” and “Mumtaz Qadri is our hero”. These men are Pakistan’s ignored. They work the lowest paid jobs, if they have jobs. They spend their time between the madrassas, the religious schools, or their homes. But they do have one thing, one thing that gives them hope. One thing that gives them power, that lifts them out of poverty and allows them a voice. That thing is religion. As they file past me they shout “God is great” and “Mumtaz Qadri is our hero”. Not all cultures are alike. We don’t share the same values. Ahh, its your culture! Why didn’t you say so! Any view of human rights that doesn’t fit the Western narrative, from the Cairo Declaration on Human Rights in Islam that was supported by Muslim states, to the Bangkok Declaration representing Asian values, is simply ignored. Instead, Western values are thought to be universal values and any effort to identify distinction is side-stepped or critiqued as racist. Culture matters. This wilful blindness about cultural difference must end, and with it the shut-up screams of “racist!”.